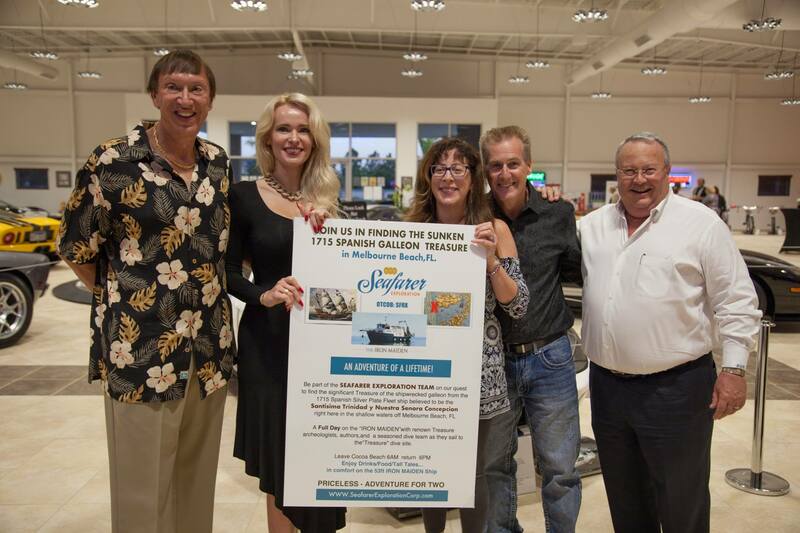 Seafarer Exploration Corp. Raises Funds for the Henegar Center for the Arts, with an exclusive “Lost 1715 Spanish Galleon” Exploration Experience Trip at local Charity Auction. The priceless adventure aboard the exploration dive boat, “Iron Maiden” experience aided the successful fundraising event for the Henegar Arts Center at the American Muscle Car Museum. Pictured above Mark and Tetiana Pielock/American Muscle Car Museum, Highest Bidders for Seafarer Trip; Caroline and Mark Cavanaugh, Kyle Kennedy/Chairman, Seafarer Exploration Corp.
Over 200 guests attended the Henegar Center for the Arts Fundraising Gala held on Saturday, March 24, 2018, at the American Muscle Car Museum in support of the historic Henegar Center of Arts. The Henegar, built in 1919, is one of Brevard County’s oldest public buildings; these former public school buildings are now a cultural and educational hub for the arts and theater in the heart of downtown, Melbourne, FL. This fundraising event was a joint community effort; the fundraiser was held at the American Muscle Car Museum, a spectacular complex housing the incredible 250 plus private car collection of Melbourne area resident, Mark Pieloch. The collection ranges from classic 1950’s to 1970’s American muscle cars – Corvettes, Cobras to Cougars, Mustangs to modern “sophisticated” muscle, such as a 2017 Shelby GT350R. The 501(c)3 Private museum, located on 42 acres in Melbourne, includes 90,000 sq.ft. of vehicle display area, an 18,000 sq. ft showroom, and an adjacent 15,000 sq.ft. maintenance and restoration facility for the collection. The museum is not open to the public, but it opens its doors to host numerous non-profit fundraisers, such as the Henegar, car activities, and educational tours for school-age children. Seafarer Exploration Corp. joined forces in the raising of funds by auctioning off the priceless opportunity for An Adventure of a Lifetime on the IRON MAIDEN, exploration boat. The live auction of “An Exploration Experience” with professional archeologists and trained divers on their quest to locate a 1715 Spanish Galleon the “Santisima Trinidad Y Nuestra Senora de la Concepcion” that lies in shallow waters off of Melbourne Beach, FL. This extraordinary opportunity was the highlight of the evening. “It was truly a successful collaboration of diverse entities; Shipwrecks, and Muscle Cars”, commented Executive Director of Henegar, Dr. Cliff Bragdon. “The diversity made it exciting, as well as, Owner Mark Pieloch and his wife, Tetiana, leading the spirited live auction helped the Henegar surpass our fundraising goal for this evening”. The Henegar Center was born from the vision of a dedicated group of community leaders. As the deterioration of two historical former public schools in downtown Melbourne became increasingly apparent, a small group formed the Brevard Regional Arts Group (BRAG) to revive the treasured landmarks. The Brevard County School System donated the facilities to BRAG for transformation into cultural arts facilities which today provides a wide range of theatrical works held in the state of the art 475-seat proscenium-style theatre, lectures, art shows and cultural events. The 501(c)3 Private museum, located on 42 acres in Melbourne, includes 90,000 sq.ft of vehicle display area, an 18,000 sq. ft showroom, and an adjacent 15,000 sq. ft. maintenance and restoration facility for the collection is not open to the public but is open to hosting numerous non-profit fundraisers, including car activities, and educational tours for school-age children. Seafarer Exploration Corp. is an underwater exploration, recovery, and conservation company. Its principal business plan is to develop the infrastructure to engage in the archaeologically-sensitive exploration, documentation, and recovery of historic shipwrecks. Seafarer Exploration was founded on May 28, 2003, and is headquartered in Tampa, FL. Seafarer, currently is exploring the waters off of Melbourne Beach, FL for a 1715 “Plate Fleet” Spanish Galleon, believed to be the “Santisima Trinidad Y Nuestra Senora de la Concepcion”, which had sunk on July 30th of 1715, along with ten other Spanish ships, due to a storm of hurricane proportions.